A different opinion here first, and then many voices against removing DACA. It's too bad our politicians don't understand that daca was a lie to all the undocumented people. They only react without actually knowing that DACA never was a path to citizenship. All it was was a delay in the process. DACA was a lie and every two years the undocumented people were still uncertain as to their status. Today, U.S. Attorney General Jeff Sessions announced that the Deferred Action for Childhood Arrivals (DACA) program, which has enabled more than 7,900 Massachusetts residents to come out of the shadows, attend college and work legally, will be phased out, with a six-month delay. We will fight to defend DACA. We will fight for the DREAM Act in Congress, to give young immigrants a clear, reliable path to citizenship. And we will fight for state and local policies to ensure that Dreamers and all people in our communities feel safe and welcome in our communities, no matter where they came from. Ending DACA is a needless act of cruelty by an administration that has been relentlessly anti-immigrant. Now, just days after defying due process to pardon a rogue sheriff, the President wants us to believe he’s acting out of respect for the law, but this is pure political pandering, at the expense of 800,000 innocent, hard-working people. It’s also unwise and antithetical to American values. DACA works: 97% of beneficiaries are employed or in school, paying taxes and contributing to our economy. Ending it will cost an estimated 700,000 jobs and $2 billion a year in tax revenue. It will force highly productive, skilled workers underground, harming U.S. businesses and impoverishing our communities. This is why DACA has overwhelming support among employers, educators, political and faith leaders, and voters. We suspect President Trump knows this, which is why he handed off the DACA announcement to Attorney General Jeff Sessions. The six-month delay to give Congress time to act is similarly disingenuous, and will cause even more chaos and confusion for very vulnerable young people. 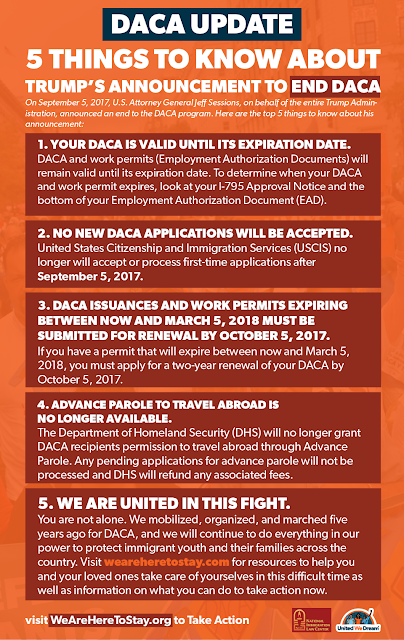 We want every DACA beneficiary to know we stand with you, and we will work relentlessly to ensure that you’re safe and have the resources you need. We urge the President to live up to his words and support the DREAM Act in Congress; his leadership could be decisive. Within Massachusetts, we will push ever harder for state policies that make everyone feel safe and welcome regardless of immigration status, including the Safe Communities Act and legislation to extend in-state tuition to all Massachusetts high school graduates. MIRA will also work to ensure that Dreamers have clear, reliable information to guide their decision-making, as well as free legal advice and referrals. We will collaborate with partners across our Commonwealth to ensure that schools, colleges, employers, and cities and towns all have the knowledge and tools they need to support our young people at this difficult time. 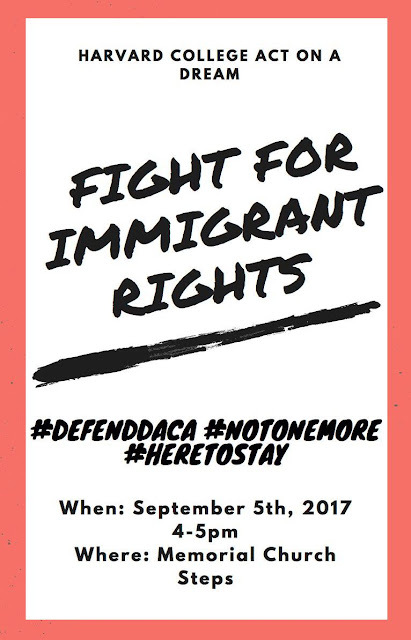 If you are in the Boston area, please join us TODAY at 4pm for a rally at Sam Adams Park outside Faneuil Hall, to show solidarity with our Dreamers and send a strong message that we will fight together. We will not give up, and we will not lose hope. We will stand with the nearly 8,000 Dreamers in our Commonwealth and do everything in our power to protect and provide for them. President Trump’s decision to end DACA is shameful and disheartening. The young women and men who are being targeted now did nothing wrong and should not be forced to live in fear because of a decision their parents made. With today’s announcement, the administration is displaying a troubling lack of compassion for these young people, who are now at risk of losing so much. I am co-sponsoring legislation in Congress that would restore DACA and give these deserving young people a path to citizenship. Today’s announcement also highlights the long overdue need for comprehensive immigration reform. Immigrants are Americans. Immigrants are bedrock to Amerca's heritage, our future, and our greatness. Immigrants are our friends, family, community members, and hard workers who make our economy stronger. Happy Labor Day, Boston! Today we remember those who helped build our country and establish workplace safety standards & worker protections. Hope you enjoy your end-of-summer celebrations!